Lend a majestic look to your plant watering with these Plant Nanny Purple Spiral Watering Globes with Stakes. The purple, spiraling lines on these 6 glass orbs add vivid color and style to your plants easily, while helping them remain perfectly watered. The six, 5" long, terracotta stakes insert into the soil of your potted plants, and their hexagonal bodies create a wealth of surface area for the water. Fill each included globe with 12 ounces of water, and place the extended neck on each into the open top of the stakes. As the soil around each terracotta piece dries, moisture is drawn downward, watering your plant roots in a consistent manner. This helps the root system remain healthy, while preventing overwatering. The transparent, glass orbs keep water levels easily visible, and their 12 ounce capacity is fantastic for use with small houseplants. Treat your favorite potted plants like royalty by adding these Purple Spiral Watering Globes with Stakes to them. 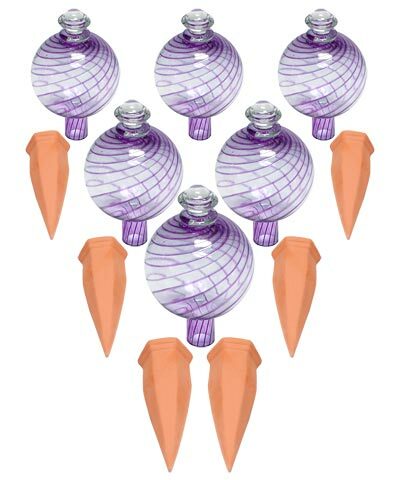 Note: This case pack includes 6 of the Plant Nanny Spiral Watering Globes with Stakes, Purple, 12 ounces each.